The Flower Shows have started and serve to give us all a bit of relief from the monotonous landscape outside the windows. 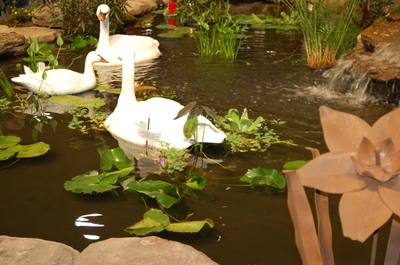 The Rhode Island Flower Show is held at the convention center in Providence, RI and it is a relatively small show. It is nowhere near the size of Philadelphia or Boston but it is still a welcome respite from the cold! This year's theme was 'Fairy Tales' and the show was held the week of school vacation so that kids could fully participate. Problems arise in the Lawn and Garden Industry when weather turns bad and since the show is run as a business I can commiserate with the show owner as Friday was a blustery, snowy day with slick road conditions and low attendance. If one did brave the bad driving conditions they were rewarded with a very good view of the garden displays unimpeded by the usual excited crowd. Click to enlarge! 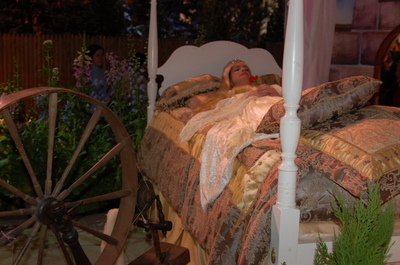 Sleeping Beauty kept a silent and not so watchful vigil over the show which featured some well known characters. Can you see who is sitting in the distance on the wall, ready to fall? 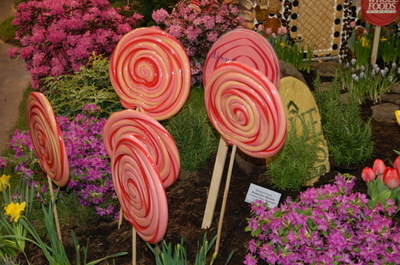 Even I was intrigued by these huge lollipops which were eye level for the kids! 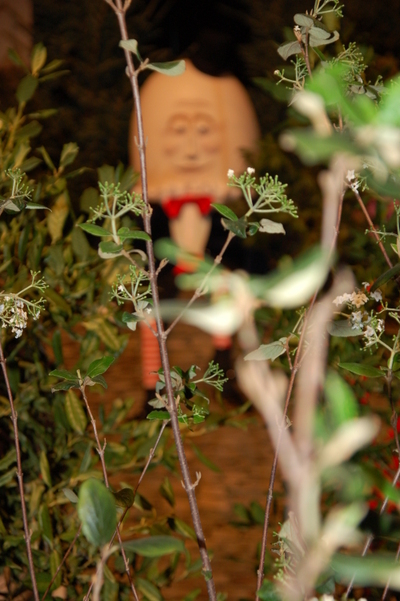 One of my favorite displays included this dramatic woodland with the figure walking through the birches. 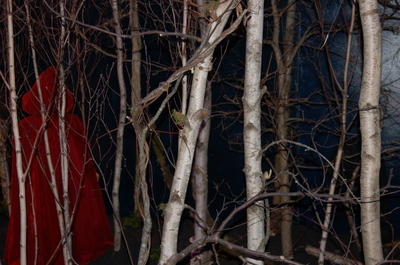 The red of the cloak and the white of the birches were stunning. 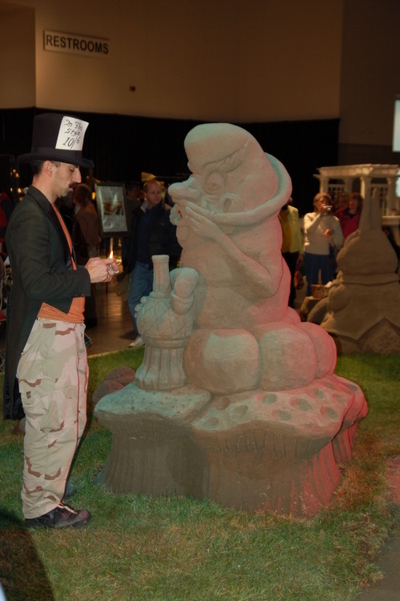 There were also swans and sand creations which were works in progress throughout the show. 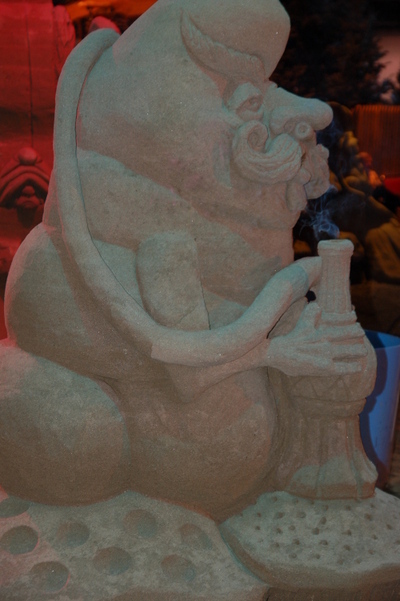 This guy actually has smoke coming out of his pipe and here is a rabbit late for work. 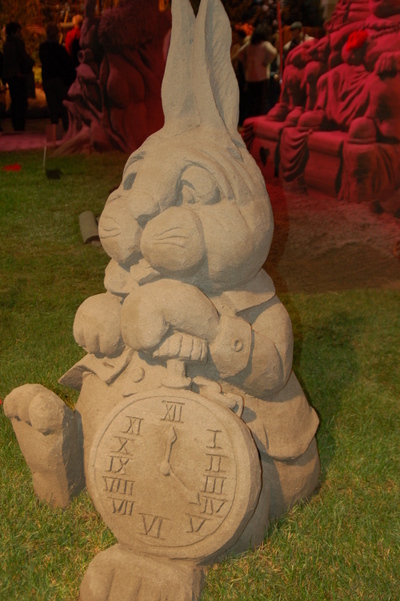 It is amazing how these creatures appear out of a pile of sand! 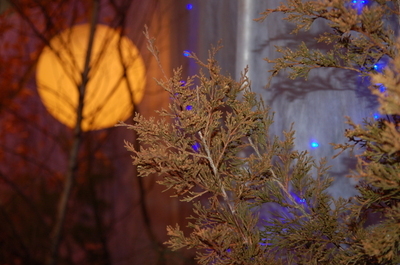 The next post will have some of the flora and a bit on the speakers. Is there a flower show in your future and if so, what do you hope to gain from going?